Ginataang halo-halo is rich, creamy and loaded with coconut flavor. 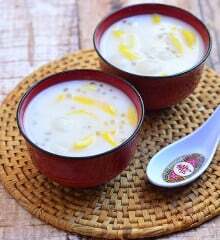 Made of glutinous rice balls, sago, tropical fruits, and tubers, it makes a delicious snack, dessert or breakfast! 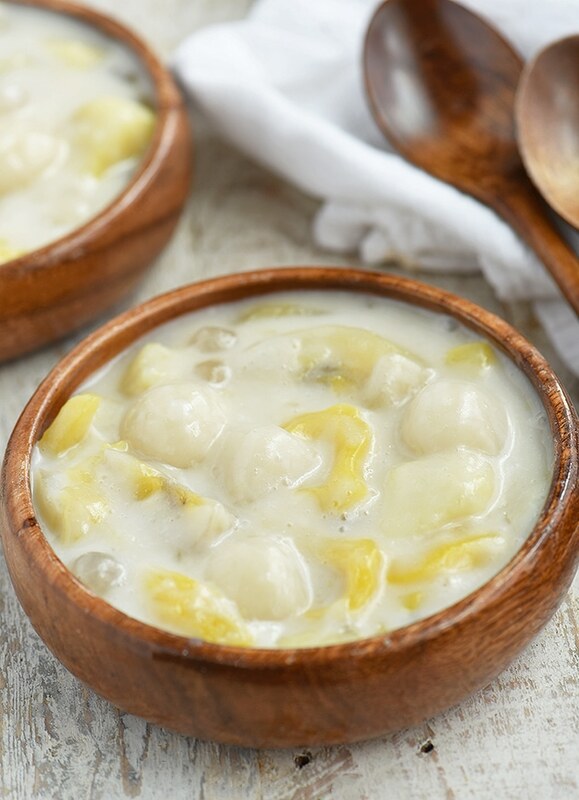 Ginataang halo-halo is a popular Filipino delicacy made of sticky rice balls stewed in coconut milk. It’s widely enjoyed as a snack, dessert or breakfast throughout the year as well as a staple dish during Lenten season when Catholics tend to fast and abstain from eating meat. 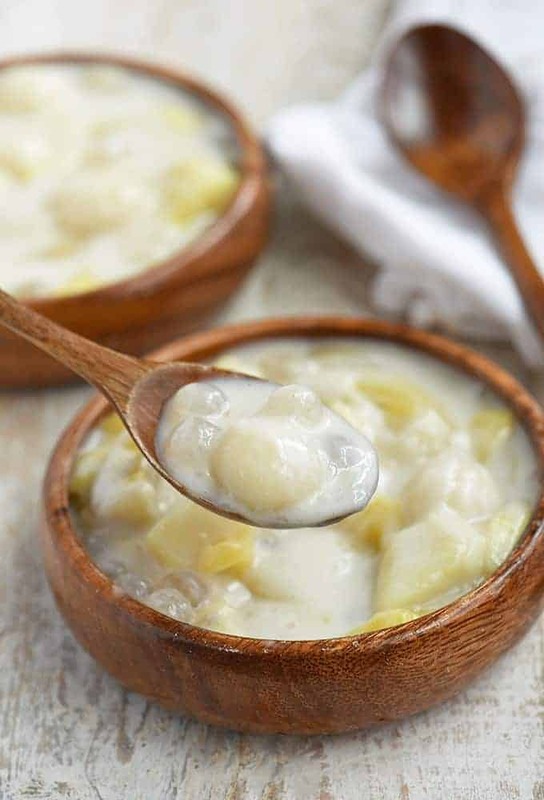 While the bilo-bilo is the central ingredient, the sweet stew may also include sago pearls, tropical fruits such as jackfruit and saba bananas, and root crops such as kamote (local yam), ube (purple yam), and taro (gabi), depending on the regional version or the availability of ingredients. Along with some variations in ingredients, the name of the dish may also differ from one area of the country to the next. 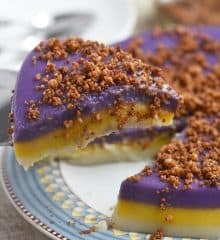 I am a Kapampangan, and we call it sampelot, but it’s also known as binignit, alfajor, linugaw, ginataang bilo-bilo, ginatan, kamio, kiniler or tambo-tambong. 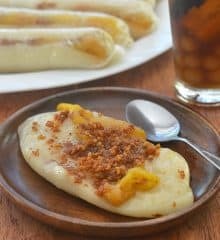 I use already-cooked sago sold in bottles to simplify the process, but if you prefer homemade, you can check out my tips on how to cook the dry pearls. I also use canned jackfruit strips but feel to use fresh fruit if available. If using the canned or bottled sago or langka, make sure to drain well as they’re usually packed in heavy syrup. Prepare the ingredients into uniform sizes to ensure even cooking. I like the creamy and mildly sweet flavor of camote, but you can also substitute taro, purple yam or sweet potatoes if you like. To pump up color and boost flavor, add a few drops of ube or langka extract to half of the bilo-bilo dough. To keep the coconut milk from curdling or separating, do not bring to a rolling boil. You can make the sticky rice balls ahead of time. Arrange in a single layer on a baking sheet or shallow plate, cover with plastic film to keep from drying out, and refrigerate until ready to use. Leftovers will keep well in the fridge for up to 3 days. Please note that the ginatan will thicken as it cools; add a generous splash of coconut milk when reheating to loosen the consistency. Give this delicious ginataang halo-halo a try. Rich, creamy, and loaded with coconut flavor, it’s sure to be a family favorite. Looking for more creamy coconut desserts? I’ve got you covered! Ginataang halo-halo is rich, creamy and loaded with tropical flavors. 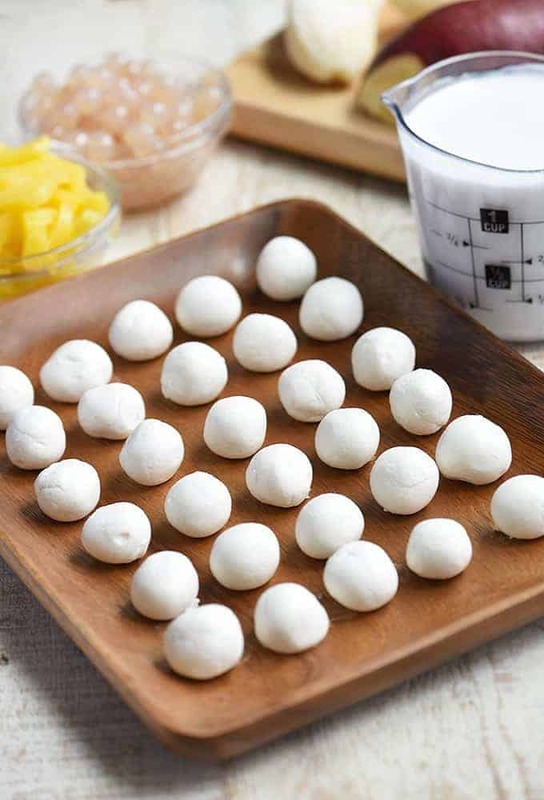 Made of glutinous rice balls, sago pearls, tropical fruits, and tubers, it makes a delicious snack, dessert or breakfast! In a small bowl, combine glutinous rice flour and 1/2 cup of the water into a pliable dough. If the dough is too sticky, add more flour; if too crumbly, add a little bit more water. Using the palms of your hands, form dough into smooth balls the size of marbles. Arrange shaped dough balls in a single layer on a baking sheet or shallow plate and cover with a cloth until ready to use. In a large pot over medium heat, combine coconut milk and the remaining 2 cups water. Bring to a simmer. Add camote and cook for about 3 to 5 minutes or until almost tender. Add bananas, sago, and jackfruit and cook for about 3 to 5 minutes. Add glutinous rice balls and cook for about 3 to 5 minutes or until they start to float on top. Add sugar and stir until dissolved. 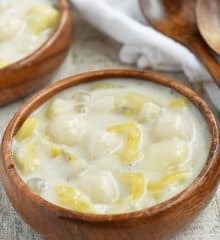 Add coconut cream and continue to cook for until bananas and camote are tender but not falling apart and the ginataan thickens to desired consistency. Serve hot or cold. Napadami gawa ko, pwede ba tong ifreezer? Hindi ko pa nasubukan i-freezer but I think it would be ok, although expect some change in the texture of the banana and camote. What is a coconut milk? The writing on your website is very small… they are very difficult to read for older people like me! How about using bigger fonts and darker colors? Then I won’t need magnifying glasses! I am sorry about that. I am planning a site redesign in the next few months, I will certainly look into changing the fonts to make it easier to read. THank you!